For all the ladies looking out for some amazing deals on kitchen appliances, here is the one for you. Ease your tasks and help yourself in the kitchen with these appliances that take less time and perform the regular chores with greater accuracy. 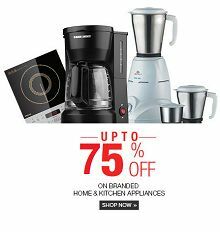 Get upto 76% off on your purchase at Flipkart. The recommended buys include kettle, Toaster, Hand Blender, Popcorn Maker, Roti Maker, Coffee Maker. The product range starts at Rs.659. Visit Flipkart and place your order now. Register or Login with your existing account.